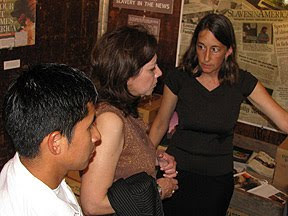 Great news out of Washington, DC: U.S. State Department to recognize CIW Anti-Slavery Coordinator Laura Germino as 2010 "Anti-Trafficking Hero"! As part of the annual TIP report release, the State Department recognizes the efforts of a handful of individuals from around the world who have shown extraordinary commitment and leadership in the fight against slavery, TIP "Heroes" as the State Department calls them. This year, Laura Germino, the CIW's Anti-Slavery Campaign Coordinator, has been chosen to receive this terrific distinction, and when she does, she will be the first U.S.-based recipient to receive the recognition. We are extremely proud of Laura, whose untiring work fighting forced labor in Florida -- beginning in the early 1990's -- helped launch today's anti-slavery movement in the U.S. Nearly twenty years later, Laura continues to investigate slavery operations, work in partnership with the Department of Justice to prosecute slavers, and train state and local law enforcement, community service organizations, and FBI personnel in how to identify and combat forced labor across the Southeast. We are also very proud that the State Department has requested that the CIW's Modern-Day Slavery Museum serve as the backdrop for the 2010 TIP report ceremony. The museum will begin its way up 95 tomorrow with the goal of making it there in one piece for Monday's ceremony in Washington, DC! The museum, housed in an actual cargo truck outfitted as a replica of the trucks involved in a recent slavery operation (U.S. v. Navarrete, 2008), may or may not make it there for the ceremony, so, just in case it doesn't, we're including here a great video on the museum and its tour earlier this year across the state of Florida. The video is set to, "Captain, Don't You Kill Old Bob," a work song performed by Fred Lee Fox, a 20-year-old turpentine worker, in 1939. The song was recorded by Stetson Kennedy, Florida's foremost folklorist and a renown human rights activist, at a labor camp outside Cross City, Dixie County, Florida. Enjoy, and check back soon for more details on Monday's ceremony in Washington! My personal exposure to the work of this organization leaves me with great happiness that this award is being given to Laura Germino. From the direct service they provide to farmworkers and their Anti-Slavery Campaign to their work on the demand side of labor exploitation and trafficking with the Campaign for Fair Food, this is definitely an organization worth following and supporting. You can gain information from their website on the statistics concerning farmworkers. You can read about their efforts in The Slave Next Door. You can explore their Take Action page to find out how you can help. Hopefully this recognition will also lead to greater attention to the slavery, abuse and exploitation that happens in our fields every day. Please follow the release of this year's report this Monday, June 14th. Congratulations to Laura Germino and the CIW!